I am so glad you are reading this (and I know that you are). I appreciate you reading this as I know there are so many words and articles and essays and blogs and more words and even more words to choose from. Thank you. First, here is video proof of CRUMBS performing at the TEDx in Munich. More on that later. We also had some predictions for 2012. We made our picks for who would die in 2012 9I know, morbid right?). I also made my very very serious predictions for the world in 2012. 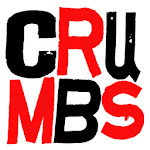 You can download all the CRUMBS radio show podcasts HERE. Also folks, you can, and should, come on down to the King's Head Pub this Tuesday to witness the first CRUMBS show of 2012. Every single Tuesday at the King's Head (as I am sure you know) there is a free comedy show, this Tuesday happens to be the amazing CRUMBS improv show. Yes the next CRUMBS show is Tuesday, Jan 3rd at 9pm! Map to the King's Head is HERE. Also also, CRUMBS took part in the TEDx Munich in 2011. We did a performance that as inspired by, and a little parody of, the talks we saw at the conference before we hit the stage. TED was a conference that started in 1984 as a platform for ideas (TED stands for Technology Entertainment and Design) and it has since become a global series of talks and meetings between smart smartypants all over the world. If you like soaking up ideas and listening to smart people talk, you can get lost on the TED website... go ahead. Upcoming shows you need to know about? A special improv show with CRUMBS and Impromptu Splendor. You are going to want to see this show. Imagine a stage with some of the best improvisers in the world performing together... and its not even during the improv festival! More details TBA, stay tuned. Another version of the comedy game show show "Kings of the King's Head". This is a crowd favourite, so show up EARLY! And of course, you can always tune in to the CRUMBS radio show live on 101.5 UMFM and listen to Lee and Stephen talk every single Monday at 5pm.